HEPA vacuums have all the power of a regular high-quality vacuum with the addition of top-notch allergen-trapping filtration. HEPA vacuums’ abilities to rid the home of allergens make them a highly recommended product by allergists when it comes to minimizing allergens in the home. Today, we will showcase the best hepa vacuum cleaners for 2019. Vacmaster’s Industrial Wet/Dry Vacuum features a certified HEPA filtration system that is 99.97% efficient. The exhaust filter is also HEPA, which means you don’t have to worry about allergens escaping back into the home. The canister on the Vacmaster Industrial Wet/Dry Vacuum with HEPA filtration has a capacity of 8 gallons. This high-volume canister capacity is part of what makes it such a good industrial vacuum; it also means you simply won’t have to clean out the canister as often. Collection bags often let small particles escape back into your home, but that’s not a problem with the Vacmaster, thanks to its fine-dust collection bag, which is capable of blocking even the smallest dust particles from escaping back into the atmosphere. The vacuum hose is 10 feet long and features a crushproof design, so that despite normal wear and tear, your hose will live as long as the vacuum itself. Ball bearing caster wheels make the Vacmaster Industrial Wet/Dry Vacuum very user friendly and easy to maneuver. This is ideal for people with weight lifting restrictions, because the wheels are of such good quality, there’s no need to pick up the canister when moving it around the house. This is an industrial vacuum, so it may be too robust for standard home usage. Some units have shipped without the washers (a part of the vacuum); this is a factory error, and doesn’t impact the way the vacuum works when it’s not missing its parts. The Shark Rotator Pro Complete Lift-Away vacuum features Anti-Allergen Complete Seal technology, which is scientifically proven to trap 99.99% of dust and allergens inside the vacuum. This feature makes it ideal for allergy sufferers, because it greatly reduces the chance of ever coming into contact with these allergens during the vacuuming process. The advanced dust cup prevents allergens from escaping back into the air as well. Two HEPA filters provide the backbone of the Shark Rotator Pro’s advanced anti-allergen system. The double HEPA filter design goes the extra mile, ensuring that dust, pollen, mold and pet hair get trapped in the filters and stay there. This powerful 3-in-1 vacuum features three different cleaning modes to ensure you get the most robust HEPA vacuuming experience possible. At its heart, the Shark Rotator Pro is a ultradurable upright. Canister vacuum mode makes cleaning an easy experience—perfect for daily maintenance cleaning. The liftaway pod makes for the ideal handheld vacuum; powerful performance combines with extreme portability to create a robust handheld vacuuming experience. The Shark Rotator Pro is a Never Loses Suction vacuum. This technology is aptly named; it’s exactly what it sounds like, preventing your vacuum from never losing suction so that throughout its entire natural lifespan, it remains just as powerful as the day you bought it. The Shark offering boasts a variety of useful features that promote ultimate ease of use. The swivel head makes getting into tricky spots easy as pie. Meanwhile, the Shark is also lightweight, so it’s appropriate for most people, even those who have weight restrictions due to injuries. It’s also quiet, so if you like to clean when the kids are taking their nap, the Shark is a good bet for that as well. • There’s no onboard storage for accessories, which some people dislike. Though, with all the accessories that come with this vacuum, adding onboard storage would add too much bulk and weight to its design. The Ovente Cyclonic Canister Vacuum’s multilevel HEPA filtration system is shown to be 99.97% effective at filtering particles down to a diameter of 0.3 micrometers. This efficiency ensures that even the finest dust particles are trapped inside the HEPA filter. One of the niftier things about the Ovente Cyclonic Canister Vacuum is its bagless design. Bags are a dust spill just waiting to happen. With the bagless design, you don’t have to worry about your debris bag breaking. The Ovente has a clear dust catcher that offers complete visibility, so you can see when it’s time to empty it out. Also, the dust catcher features an LED light which lets you know when the dust catcher is at capacity. (This LED light system also lets you know when it’s time to change your filters.) The dust catcher conveniently empties into the garbage can; when done, simply rinse it out and replace it back into the vacuum. The Ovente’s wand deserves special mention due to its high level of practicality in design. Not only is it telescopic, so you can extend it to reach hard-to-reach places, it’s also bendable, further upping its ability to reach places other wands simply aren’t able to go. The Ovente Cyclonic Canister Vacuum comes with a wide array of accessories included with purchase to up its utility into overdrive. Aside of the bendable telescopic wand, you also get the following: combination brush, crevice tool, floor brush (for hardwood and carpet), upholstery tool, pet brush and the bendable multi-angle brush. The Ovente vacuum comes with several ease-of-use features. On top of its bagless design, it also features washable filters, a retractable cord and a step button off/on switch. 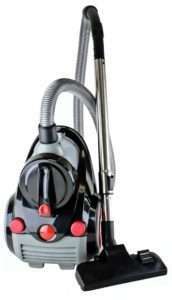 • The Ovente Cyclonic Canister Vacuum overwhelmingly gets a lot of praise. Mainly, complaints are centered around the cord. Some simply feel it isn’t long enough. That said, at 5 meters in length, it should do well for most standard sized rooms. Ovente’s HEPA filtration technology is powerful enough to trap 99.97% of micro particles. Wand attachments are great for cleaning curtains and ceilings, and Ovente’s adjustable telescopic wand capitalizes on that advantage by being fully adjustable to suit your needs. The translucent dirt bin is easy to release directly into the garbage—no getting your hands dirty. Additionally, the see-through design makes it easy to see when it’s time to empty the bin. If you feel like your dirt bin needs some extra cleaning, simply rinse out with water; dirt bin maintenance has never been so simple. Ovente markets their Bagless Canister vacuum as being a good deal, because it comes with all the accessories necessary to give your home the full premium vacuuming experience. Accessories include: floor brush attachment, crevice attachment, telescopic wand and bristle brush. • It has a cord, which may not jive with everyone’s preferences, though it has no impact on how the vacuum functions as a whole. Sealed HEPA filtration ensures that the allergens and dust the Prolux Tritan captures in its HEPA filter never make it back into your house; this is a great technology for those especially sensitive to allergens. The Prolux Tritan is designed for multi-floor usage: Tile, hardwood and carpet are all a breeze with the Tritan. The Prolux Tritan features onboard accessories and tools so everything you need to vacuum your home to spotless perfection is always at arm’s length. At just 15lbs, the Prolux Tritan is one of the lighter weight HEPA vacuums on the market today—great for folks with bad backs. • People find some of the attachments don’t secure perfectly, but this isn’t a widespread problem, and may just be a faulty unit. While there were many respectable HEPA vacuums this roundup, one winner stood out as the best: The Shark Rotator Pro Complete Lift-Away. It wins for being extremely powerful and user friendly, as well as boasting a high reliability factor, making it very tough to beat.